We are a comprehensive design/ build firm offering design services, including space planning, and color and texture consultation. We retail materials; cabinetry, countertops, tile, hardwood and stone flooring, plumbing products like tubs, toilets, sinks and faucets, lighting, and all of the installation and construction. We specialize in kitchens and baths but do closets systems, garage storage and office systems as well. 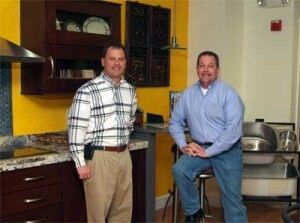 Craig Ricciarelli and I opened the business in 2006, but I have designed thousands of kitchens and baths on the South Shore over 25 years. Craig came from the Marine industry and has been remodeling for 7 or 8 years. We saw a need in the area for good, affordable design and decided collaboration like transitions was the way to go! We have five employees beside Craig and me, three designers and two carpenters. 4. What do you want people to know about you and/or your business? We work very hard to make your “transition” from old to new a pleasure! Remodeling doesn’t have to be daunting! In the end, we forget the pitfalls! I love kitchen and bath design and our designers are passionate about design too. Knowing our clients enter their new kitchen every day and think “I love my new kitchen!” is huge! Have you heard “don’t sweat the small stuff”? The truth is, you have to sweat the small stuff because it IS the small stuff that matters! My business partner Craig is a great businessman and a great mentor! Of course the economy affects every business but having experienced soft markets before, we know how to deal with it. Stick to fundamentals, offer good service and fair prices. Well, we had a toilet display in the showroom and a young mom and her potty training tot were browsing when the little guy took it upon himself to proudly use the potty “all by himself”… red faces all around! We all have 20/20 hindsight… but no regrets. Transitions Kitchens and Baths is a life long dream come true!